While parts of Worcestershire were underwater, Woodbridge, for once, was inundated with sunshine. Mere handful of coffee shops left to visit. Group decision to grab and go. 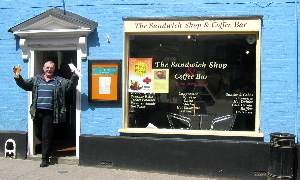 If you're on the Thoroughfare, start at Mrs Piper's (number 65), perambulate past Jars Of Clay (number 49) and the Georgian Coffee House (number 47a), decelerate once you hit The Cake Shop and here, at number 17, is the Sandwich Shop & Coffee Bar. All on the map, needless to say. Been spoiled with waitress service the last few months; odd to join the hoi polloi in a queue. Wait our turn? Don't you know who we are? I'll be writing this up on my website! Ashley, we *could* have taken three-quarters of the shop's seating capacity -- they've squeezed in two sets of two chairs and tables -- and shouted out our orders. As mentioned, far too pleasant to linger indoors. Above the serving ladies, there's a big ol' board crammed with filling choices. Decision paralysis can easily set in. Focus on a known quantity and go with it. Don't be put off by the Mexican chicken or brie & bacon or bacon buttie -- go for the aromatic duck. On white or brown? Only you can decide. Brisk and efficient service. Large baguette was a very reasonable £2.50. Extra for Quavers and a bottle o' pop. Though certain parties couldn't resist the red bottled temptation of a Spa Barisart. Wandered down past the bookshop and into Elmhurst Park, "beautifully set between the Town Centre and the historic River Deben". Doesn't get much better than plonking yourself down on the grass, feeding your face and watching the world of Woodbridge go by. Always good to see a mum trying to teach her daughter not to throw like a girl. Still time for coffee and cake at Browsers (do this properly another time?) and to pick up a ginormous Potter poster, free to a good home. If it was a car -- Toyota Yaris. If they were passing by -- Bonnie Langford.